Are you just about to Hire your iOS Objective C Developer? Objective-C is extremely powerful but also one of the harder programming languages to learn, which is why evaluating candidates for their Objective-C Development skills is a crucial step before hiring. To help you find your next iOS coding genius, I have compiled a list of Topics interview questions that can be asked while interviewing an iOS Objective-C developer. Below is the round-up of few interview questions for an iOS Objective-C developer. Question complexity may differ as per the experience level. If you would like to conduct an employment test for Objective-C developer - check this out. Here is the compilation of few interview questions for an iOS Objective-C developer. What is the difference between boxName and self.boxName? How autorelease pool is managed? Why is category better than inheritance? What is the split view controller? The advantages and disadvantages about synchronous versus asynchronous connections. Three occasions when you might use your own autorelease pools. Can we use one tableview with two different datasources? How will you achieve this? Difference between categories and extensions. Difference between shallow copy and deep copy. How to access the encapsulated data in objective-c? Tell four frameworks used in iphone. What are layer objects and what do they represent? How do you change the content of your app in order to change the views displayed in the corresponding window? Which object manage the presentation of app’s content on the screen? Are document objects required for an application? What do they offer? How is the app delegate is declared by Xcode project templates? Assume that system is running low on memory. What can system do for suspended apps? An app is loaded into memory but is not executing any code. In which state will it be in? Give example scenarios when an application goes into InActive state. Which framework delivers event to custom object when app is in foreground? What is atomic and nonatomic? Which one is safer? Which one is default? What are all the difference between categories and subclasses? Why should we go to subclasses? Can you explain what happens when you call autorelease on an object? 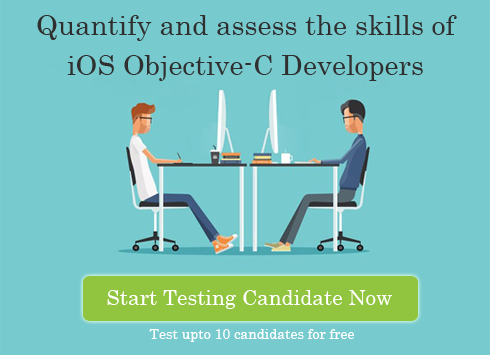 If you want to quickly evaluate a candidate for his technical skills in Objective C for iOS, Interview Mocha has created an online iOS Objective-C skill test that contains meaningful application oriented and theory based questions to evaluate the job readiness of an iOS developer. Let us know how you find this test?